We talked about making a tee-pee for the backyard and it wasn't until my husband threatened to buy on on Etsy that launched me into a craft frenzy. 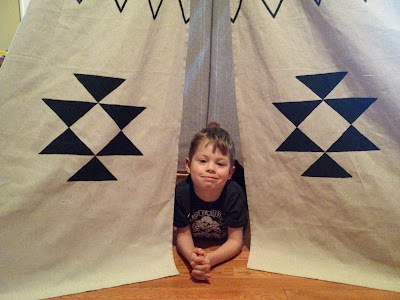 I found a great tutorial online that uses canvas tarps, wooden dowels and black fabric paint. I was able to complete the project in 1 weekend - painting included!